Breeders constantly hypothesize about future breedings. Not only are they considering cross-faulting all of the physical attributes that can be passed on to the offspring, but coat color and pattern are a major concern, as well. Cavalier King Charles Spaniel coat inheritance patterns can be confusing as there are two pairs of genes (one for color and one for pattern) that determine the color and pattern of the coat. Most breeders are familiar with the use of the Pundit square when determining potential genetic inheritance patterns. This book takes the Pundit square the next step. Not only is the Pundit square provided for each potential color and pattern combination, but also color pictures are used to graphically represent the possible color and pattern combinations. Additionally, this guide provides the probability (percent of likelihood out of 100%) for each resulting coat color and pattern combination for a given potential breeding. 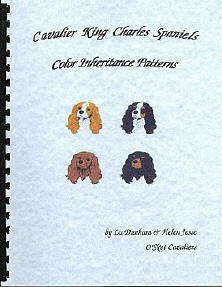 The authors, Lu Dunham and Helen Jesse, while relative newcomers to the breed of Cavalier King Charles Spaniels have more than 35 years combined experience breeding and showing pure bred dogs. In their “real lives” both were educators and held faculty positions for a number of years. They have separately and together authored and co-authored articles in magazines, professional journals and books. Read our Guestbook! ~ Sign our Guestbook! You may not copy any text, graphics or pictures from these pages without written permission.